Hydrocarbons such as CH4 are known to be formed through the Fischer-Tropsch or Sabatier type reactions in hydrothermal systems usually at temperatures above 100°C. Weathering of olivine is sometimes suggested to account for abiotic formation of CH4 through its redox lowering and water splitting properties. Knowledge about the CH4 and H2 formation processes at low temperatures is important for the research about the origin and cause of early Earth and Martian CH4 and for CO2 sequestration. We have conducted a series of low temperature, long-term weathering experiments in which we have tested the CH4 and H2 formation potential of forsteritic olivine. The results show low temperature CH4 production that is probably influenced by chromite and magnetite as catalysts. Extensive analyses of a potential CH4 source trapped in the crystal structure of the olivine showed no signs of incorporated CH4. Also, the available sources of organic carbon were not enough to support the total amount of CH4 detected in our experiments. There was also a linear relationship between silica release into solution and the net CH4 accumulation into the incubation bottle headspaces suggesting that CH4 formation under these conditions could be a qualitative indicator of olivine dissolution. It is likely that minerals such as magnetite, chromite and other metal-rich minerals found on the olivine surface catalyze the formation of CH4, because of the low temperature of the system. This may expand the range of environments plausible for abiotic CH4 formation both on Earth and on other terrestrial bodies. The CH4 detected in the Martian atmosphere [1–3] in 2004 raised the question whether or not the CH4 were formed biotically or abiotically. It was suggested by Krasnopolsky et al. that microorganisms on Mars may have produced it. However, several abiotic processes may be responsible for the detected atmospheric CH4, such as volcanism, exogenous sources and serpentinization of ultramafic rocks [4–6]. There are too few hot spots present on Mars to account for the CH4 concentrations that were detected and volcanism is not likely to be the major source of CH4 on Mars. Neither are the exogenous sources, such as meteorites and comets, for the same reason. Oze and Sharma  have calculated reaction rates for olivine dissolution on Mars, using olivine chemical compositions found in the Martian Schergottite-Nakhlite-Chassigny (SNC) meteorites, a temperature of 25°C and varying pH. They came to the conclusion that dissolution of olivine is favorable in the subsurface of Mars at such low temperatures, both kinetically and thermodynamically, which means that serpentinization would be a potential source for CH4 detected on the Martian atmosphere. On the contemporary Earth, there are also CH4 seeps and plumes that are suggested to be of abiotic origin, at least to some extent [7–9]. Abiotically formed CH4 may provide carbon and energy for microorganisms in the deep subsurface biosphere and may serve as a precursor for forming longer hydrocarbons such as natural gas and oil. This process may be important for CO2 sequestration. Basaltic (45-52% SiO2) and ultramafic (<45% SiO2) hydrothermal systems as well as continental groundwaters host a vast number of bacterial and archaeal organisms [10, 11] found at depths down to at least 800 meters below the seafloor (mbsf)  and in volcanic glass at depths down to 954 mbsf . Microbial communities are also found in volcanic hot springs, in saline groundwaters at depths exceeding 2 km in igneous rocks, and in continental flood basalts . Some microorganisms living in these environments are chemolithoautothrophs, i.e., they are autotrophic organisms that derive their energy from inorganic compounds such as H2 and CH4 emanating from rock-associated fluids and gases. An important question is to what extent microorganisms can use the chemical energy released exclusively from the alteration of olivine, one of the most common mineral in the Earth mantle [14–19]. This question bears upon the dynamics of contemporary subsurface microbial communities and the possibilities for such extreme environments to be modern analogues to early Earth ecosystems. Weathering of olivine is sometimes called serpentinization due to the formation of serpentine minerals as alteration products. Fluids associated with serpentinization hydrothermal vent systems such as Lost City in the Atlantic Ocean often show elevated concentrations of CH4 , which can be a product of H2 reacting with CO2 or CO, gases that can be found in hydrothermal systems. Hence the abiotic interaction between water and mafic minerals can result in formation of H2 and CH4 which both represent high quality electron donors for chemosynthetic organisms (e.g. hydrogenotrophic and methanotrophic microorganisms). The release of H2 from weathering of mafic minerals may be due to either formation through water reduction or release from the mineral itself. Freund et al. suggest that nominally anhydrous minerals such as olivine, contains a considerable amount of H2 within its crystal structure in the form of hydroxyl anions (OH-) or peroxy links released upon fracturing or heat. The formation of molecular H2 may also be coupled to the formation of magnetite (Eq. 1). In that reaction, ferrous iron is oxidized to ferric iron together with the reduction of water to H2. However, if the silica activity is high, serpentine or brucite will incorporate the iron into the crystal structure and thus prevent it from becoming oxidized  and thus prevent H2 formation. The Fischer-Tropsch (FT) reaction (Eq. 2) is widely known in the oil and petroleum industry as an abiotic, catalyzed reaction capable of producing CH4 and longer hydrocarbons such as petroleum, waxes and oils  from gaseous H2 and CO. The usual catalysts for that reaction are magnetite, Co and Ru oxides. The specific formation of CH4 from H2 and CO2 is also called the Fischer-Tropsch Type (FTT) or Sabatier reaction (Eq. 3). The FTT reactions are modified from the FT reaction in the way that the carbon source is CO2 instead of CO and the presence of water . This reaction is often used to explain the presence of abiotic CH4 and other hydrocarbons in some natural systems on Earth . The formation of CH4 in ultramafic natural systems is often thought to be the combination of the FTT reaction linked to the formation of H2 through the olivine hydration process [7, 24]. FTT reactions are considered to be common in hydrothermal systems and ultramafic rocks and have also been the focus for research considering the abiotic formation of precursors of biologically critical molecules such as amino acids and lipids [7, 8, 17, 25]. Berndt et al. conducted olivine dissolution experiments based on the study of Janecky and Seyfried . They wanted to explicitly study the CH4 forming processes coupled to olivine dissolution and serpentinization at 300°C and 500 bars. They could see a distinct increase in CH4 throughout the experiments and also an increase in other hydrocarbons such as C2H6 and C3H8. The catalyst present in their experiment was exclusively magnetite. Later, Horita et al. confirmed the formation of CH4 through serpentinization, but also showed that magnetite is not the only and most efficient catalyst to form CH4 in an olivine dissolution environment. Instead, the presence of awaruite (Ni3Fe) increased the rate of formation severalfold. Since awaruite is a common associated mineral in ultramafic rocks , this approach was highly relevant. Another experiment made by McCollom et al. with the purpose of investigating the formation of hydrocarbons through serpentinization of olivines and with no additional catalysts, showed continuous increase of CH4 throughout the experiment. The experiments were conducted under a pressure of 350 bars and 300°C. However, most of the CH4 (about 80%) found in these experiments was most likely not formed but was suggested to be released from fluid inclusions and carbon species within the olivine crystals. Another interesting observation in their experiments, though, was the need of fresh mineral surfaces in order to form CH4 which was probably due to partial oxidation of the surface. Instead of Ni-bearing catalysts, Foustoukos and Seyfried  used a mixture of Cr and Fe oxides (chromite, FeCr2O4) in an effort to produce hydrocarbons under hydrothermal conditions (390°C and 400 bars). Chromite is commonly associated with olivine-rich rocks and would therefore be part of a natural ultramafic hydrothermal system. The found CH4 concentrations were higher than earlier experimental efforts without the presence of Cr,Fe-bearing catalysts. It is now widely accepted that CH4 may be produced abiotically though serpentinization reactions at temperatures around 300°C. Previous studies regarding the FTT or Sabatier reactions often considered temperatures over 100°C. 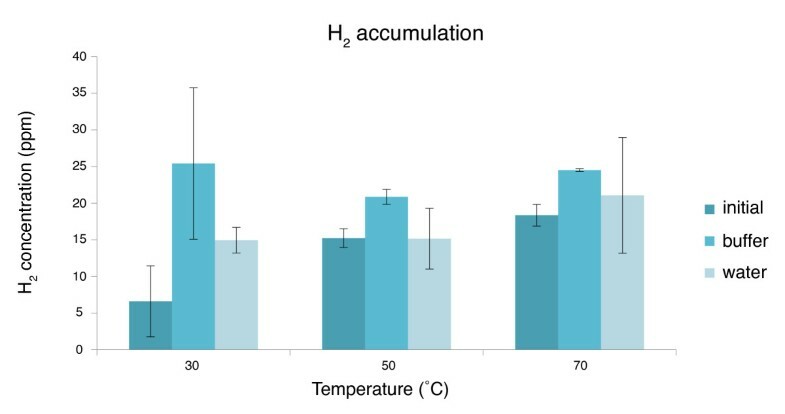 High temperatures promote faster reaction rates and lower kinetic barriers but are not suitable for living cells and can only support chemosynthetic life at a distance along a diffusion and temperature gradient within a hydrothermal environment, such as the porous lava layers or the diffuse vents in which hot hydrothermal water is mixed and quenched by downwelling seawater. However, if significant H2 formation with additional, indirect formation of reduced compounds occurs at lower temperatures, it would drastically expand the potential environments where such reactions can support microbial life. Studies of olivine alteration at lower temperatures are essential regardless of slower reaction rates and the need of long-term studies. In this study we focus on serpentinization in the temperature range of 30 to 70°C and whether significant formation of H2 and CH4 can be measured at such temperatures. Olivine sand was incubated with buffered and non-buffered Milli-Q water in glass infusion bottles at three different temperatures: 30, 50 and 70°C. Natural olivine sand (Forsterite 91, Fo91) from North Cape Minerals in Åheim, Norway was used in the dissolution experiments. Grain sizes ranged between 0.125 and 1.00 mm with the majority of the grains between 0.250 and 0.500 mm. We made specific surface area measurements using the B.E.T. method on a Micromeritics ASAP2020 Surface Area and Porosity Analyzer with N2 as a carrier gas. Prior to the B.E.T. measurements, ~ 8 g of olivine was degassed at 300°C for 600 min in order to remove any adsorbed gases or liquids. The olivine sand was washed with deionized water about 15 times until the water around the grains was clear. Thereafter, the material was washed in acetone in an ultrasonic bath for 5 minutes in order to remove finer particles and adsorbed organic material. The sand was dried overnight at 30°C. The 120 mL glass incubation bottles were all washed in deionized water and combusted at 550°C to remove organic carbon compounds. Approximately 25 g of olivine was weighed and put into each incubation bottle together with 60 mL of liquid. 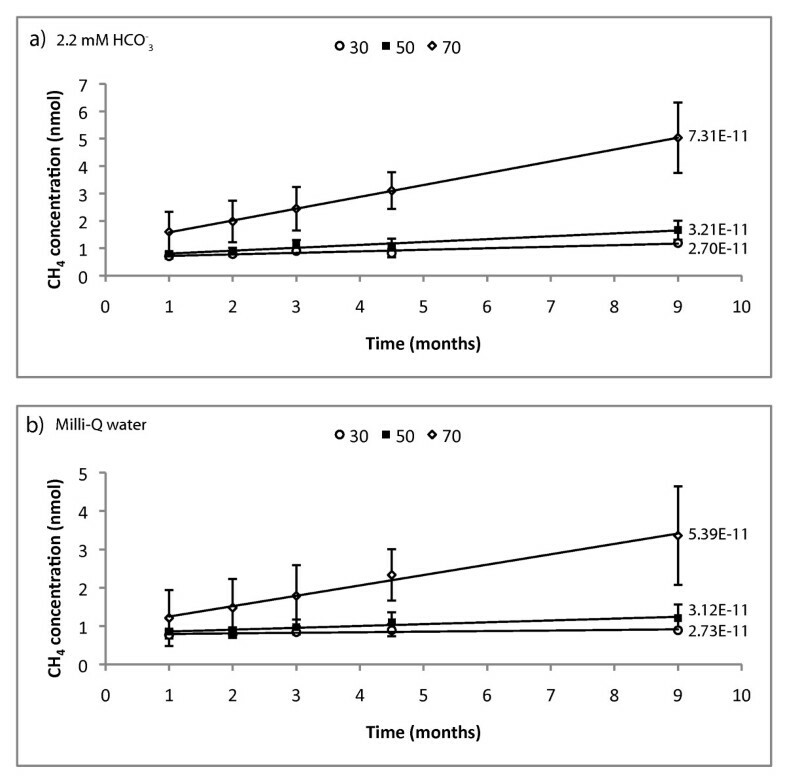 Two different liquids were used in the experiment, 2.2 mM bicarbonate buffer and pure Milli-Q water (with a water resistivity of 18.2 MΩcm) in order to trace the differences in CH4 formation with and without added dissolved CO2. The pH was measured in all bottles to be between 8.35 and 9.44 and with average values of 9.07 for the pure Milli-Q water and 8.67 for the buffered Milli-Q water. Bottles were sealed with massive 10 mm thick butyl rubber stoppers (Apodan, Denmark) and an alumina crimp seal cap. Blank samples without olivine sand were prepared. To obtain an O2 free environment, all bottles were evacuated and flushed with CH4 free N2 repeatedly three times to an overpressure of 2 bars. The bottles were equilibrated to atmospheric pressure before autoclaving at 140°C for 20 minutes. After sterilization, initial samples were taken and then the bottles were incubated for 9 months at three different incubation temperatures; 30°C, 50°C and 70°C. The bottles were not shaken or stirred. Conversion between ppm and moles were calculated with the ideal gas law. X-ray Diffraction (XRD) was used to identify mineral phases other than olivine in the sand. The analyses were made at the Swedish Geological Survey on a Siemens D5000 theta/theta diffractometer with CuK radiation and a graphite monochromator at 40 kV and 40 mA. Doubly polished olivine thin sections with a thickness of about 200 μm  were analyzed microscopically to identify mineral phases, analyze mineral contacts, and to evaluate the occurrence of fluid inclusions and microstructures. An XL30 environmental scanning electron microscope with a field emission gun (XL30 ESEM-FEG) was used to analyze the mineral surfaces before and after incubation in order to identify possible mineral coating, pitting, etching or other changes to the mineral surface. The ESEM was equipped with an Oxford x-act energy dispersive spectrometer (EDS), backscatter electron detector (BSE) and a secondary electron detector (SE). Peak and element analyses were made using INCA Suite 4.11 software. Headspace CH4 measurements were made on five occasions by injecting 2 mL of N2 into the incubation bottles followed by removing 2 mL of gas sample with a syringe which were loaded on a 500 μL injection loop then injected into a gas chromatograph with flame ionization detection (GC-FID, Shimadzu 8A). CH4 was separated from the matrix gas with a 2 m × 1/8 " o.d. stainless steel column packed with HayeSep Q 80/100 at 50°C using N2 carrier gas. A 99.9 ± 2 ppmv CH4 standard was used for calibration (Air Liquide). Similarly, a 500 μL loop of headspace gas was injected into a gas chromatographer with a reducing compound photometer (Peak Performer Reduced Gas Analyzer PP1)  to measure H2 and CO. After being separated from the matrix gas through a system of two-packed columns using N2 carrier gas, H2 was indirectly detected and quantified by the liberated mercury vapor from the heated bed of mercury oxide with a UV (254 nm) absorption photometer. A 10 ± 2 ppmv H2 standard (Air Liquide) was used for calibration. CO measurements were made without quantification. Carbon species were identified and quantified by XPS (X-ray Photoelectron Spectroscopy). XPS spectra were recorded with a Kratos Axis Ultra DLD electron spectrometer using a monochromated Al Kα source operated at 150 W, a hybrid lens system with magnetic lens providing an analysis area of 0.3 mm × 0.7 mm, and a charge neutralizer. The binding energy (BE) scale was referenced to the C1s line of aliphatic carbon, set at 285.0 eV. Processing of the spectra was accomplished with the Kratos software. To investigate mineral dissolution, liquid phase elemental analyses with Inductively Coupled Plasma Optical Emission Spectroscopy (ICP-OES Spectro, Varian Vista AX) with Ar as a carrier gas and an analytical error of about 4% were made in a subset of the bottles (2 measurements per variable). Samples were prepared by mixing 4 mL of sample solution with 40 μL of HNO3 in order to keep the trace metals dissolved. The relative error was ~ 4%. The XRD data indicate that the initial forsterite-dominated olivine contained accessory minerals including chlorite, talc, phlogopite and a Fe-Cr-oxide, probably a chromite-magnetite or chrome-bearing chlorite, and small peaks indicative of possible pyroxenes and magnesite, a magnesium carbonate. Chopra et al. define the composition of the Åheim forsteritic olivine as 96% olivine, 4% accessory minerals (mainly pyroxene, clinochlore and phlogopite) and less than 1% spinel. ESEM analyses also show clear Cr, Ni, Cu and Fe-rich areas at localized spots on the grain surface (Figure 1). Microscopic analyses of the initial olivine show both interstitial spinel crystals and well-defined chlorites. Some indications of pitting and precipitations after incubation could be seen with ESEM, see Figure 2. Otherwise, no major changes could be seen with optical microscope. ESEM spot analyses of potential catalyst sites on the olivine surfaces used in the incubation experiments. Relative proportions of elements in weight percent is presented in each picture. The high carbon content in picture B and D is due to carbon coating of the sample. A) SEM image of a chrome-spinel crystal taken using optical microscopy, B) SEM image of a Cr and Fe-rich phase C) SEM image of a Fe-rich phase and D) SEM image of Fe, Ni and Cu-rich phases. 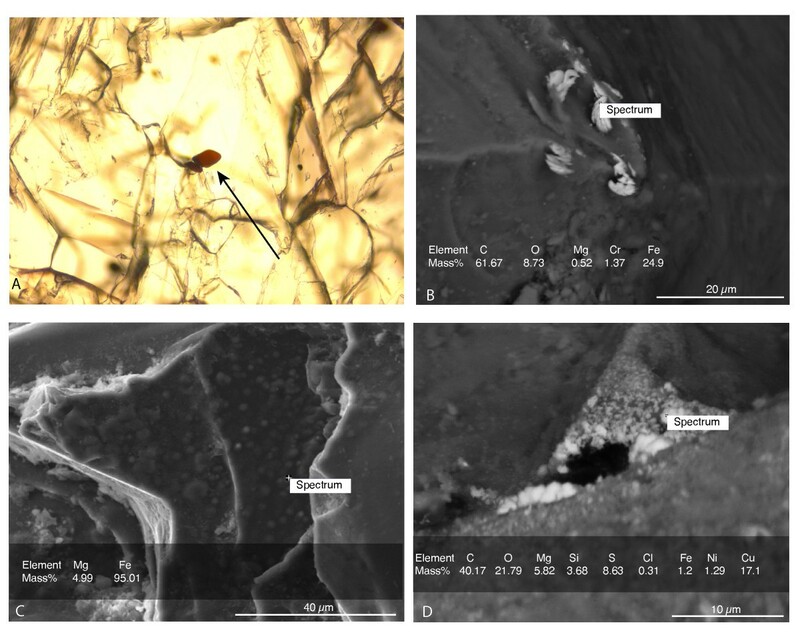 ESEM pictures showing water influence on olivine surfaces before and after incubation. An initial olivine grain surface (A) is relatively "clean" from pit marks, etching and precipitates compared with the incubated grains which show a slight increase in small crystal precipitates on the surface (B) and pit marks (C). After flushing the bottles with CH4-free N2 and autoclaving, the headspace gas concentration was measured in order to get initial point analyses. Initial gas concentrations in the headspace of the bottles of H2 were 0.019 nmol and CH4 less than 0.31 nmol, Table 1. CH4 accumulated linearly over time in all incubation experiment bottles, (Figures 3a-b). The error bars are calculated from the standard deviation of the concentrations and indicate a larger element of uncertainty in the non-buffered analyses. However, analysis of variance (ANOVA) comparisons showed no substantial differences between buffered and non-buffered CH4 formation concentrations (p = 0.42, F = 0.71). There are some clear ANOVA distinctions between the different temperatures (p < 0.0005, F = 41.97). No quantification of the CO data was made and the CO2 was measured only in the end of the experiments. Both CH4 and CO2 is temperature dependent whereas H2 is not. Accumulation of CH 4 (in nmol) in the headspace of the incubation bottles as a function of time. a) is the concentration of CH4 in the bottles containing 2.2 mM bicarbonate buffer and the accumulation rates in mol/m2/s and b) is the concentration of CH4 in the bottles containing only Milli-Q water and the accumulation rates in mol/m2/s. All values are after subtracted control values. The dissolution rates in Table 2 were obtained from the linear regression of the data, Figure 3, and the B.E.T. surface area analyses. The rates of CH4 are calculated from the net accumulation in which the controls are subtracted from the samples. pH measurements were made before and after the experiments. The increase in pH in the water samples after 9 months is around 1.31 and in the buffered samples about 0.87 pH units. Final H2 concentrations were measured after termination of the experiment, Figure 4. Rates of dissolution calculated from the release of Si and Mg into solution and from the accumulation of CH4 into the headspace of the experiment bottles after 295 days of dissolution. The CH4 rate is calculated from the net accumulation of CH4 into the headspace of the bottles, i.e. with the control values subtracted from the analyzed values. The pH is changing between the buffered and non-buffered groups but not remarkably within the groups. Concentration of gaseous H 2 in the headspace of buffered and Milli-Q water incubation bottles. There is a higher concentration of H2 in bottles with 2.2 mM bicarbonate buffer compared with the Milli-Q water bottles. There is no clear temperature dependence on the accumulated concentrations. Mg, Ni and Fe concentrations in solution are shown to be temperature and pH dependent (Figure 5 a, b and 5c). In the buffered solutions with stable pH values, there is a decreasing trend of dissolved Mg, Ni and Fe ions. In the non-buffered solutions there is a strong increase in dissolved ions with temperature and time at temperatures below 70°C. In the 70°C treatment the concentrations decreases drastically. ICP analyses of elements in solution. Concentration of elements in ppm released into solution after one and two months of incubation as a function of temperature. Mg (a), Ni (b), Fe (c) and Si (d). An increase of Si over time was observed in all samples (Figure 5d). There is a consistent trend of increasing Si concentration in solution with both temperatures in the buffered and unbuffered samples. There is a linear relationship between the release of Si into solution and CH4 accumulation in the headspace (Figure 6). 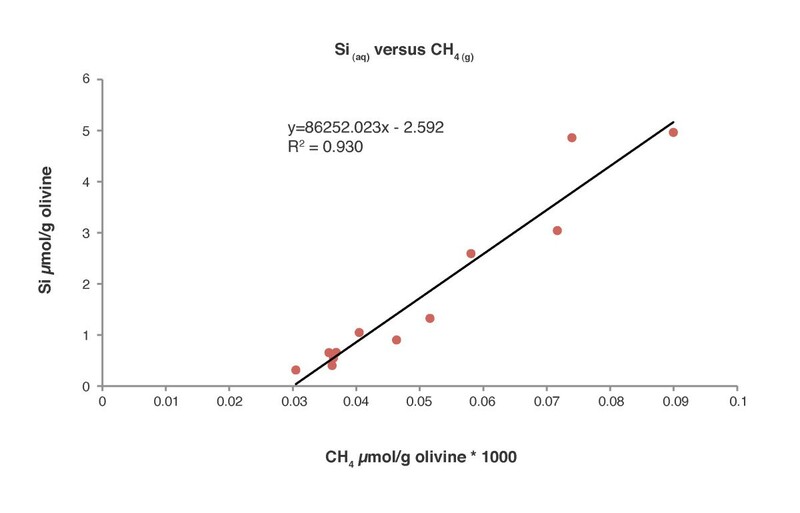 The degree of correlation between the data represented in Figure 6 is very close to 1 (R2 = 0.93) suggesting a strong correlation between the CH4 and Si data. The average amount of Si of the olivine sand in the bottles is about 5 g/25 g of olivine. The average wt% loss of Si from the olivine into solution after incubation at 70°C is around 0.035 wt%/month of the initial Si weight and at 30°C the average wt% loss is around 0.0045 wt%/month. Si release into solution (μmol/g olivine) and formed CH 4 gas (μmol/g olivine*1000) in the incubation bottle headspace. Random samples of Si from all sample groups were plotted against CH4. There is a nearly linear accumulation of CH4 in the sample bottles, Figure 3a-b. In all measurements, the concentration of CH4 in the controls are lower than in the sample bottles, indicating that CH4 was either formed or released from the olivine sand continuously over time at all temperatures. The controls are subtracted from the sample values and a net accumulation is shown in Figure 3. There seems to be CH4 accumulation in the buffered experiments even in the bottle without olivine and thus no access to any obvious catalytic sites. These results are most likely due to hydrocarbon release from the rubber septa used for the experiments but also some formation of CH4 from the carbon background in the solution. There is the possibility that CH4 is not formed but is released from the olivine crystal structure or from small fluid inclusions or that it could be the result of decomposition of longer hydrocarbons . Microscopic analyses of thin sections do not reveal any gas inclusions and the amount of available surface carbon is not enough to form CH4 to the extent that we have recorded. When calculating the amount of available carbon on the exposed olivine surface using the surface area from the B.E.T. measurements together with the available XPS data of the amount of hydrocarbons, it was found that the amount of hydrocarbons at the total exposed olivine surface is 0.06 nmol, which is much less than the amount of CH4 accumulated in the bottles, Figure 3. Altogether, the total amount of available organic carbon species in the blank controls are identified to be about one order of magnitude less than the measured concentrations of CH4 in the sample bottles. XPS analyses showed a total carbon content of 7.24 at% in which 5.15 at% are hydrocarbons and 2.09 at% are other types of carbon like-COOR groups (esters) for example, but not carbonates. In Figure 3, showing the amount of CH4, the error is larger in the non-buffered bottles possibly because of a larger system response due to the non-regulated pH. Olivine weathering reaction rates are suggested to decrease with increasing pH . That would mean that the weathering rates in this study would slightly decrease in our non-buffered experiments with time in contrast to the buffered samples due to the larger pH increase in the water experiments, which is vaguely indicated in Table 2. However, as mentioned earlier, the ANOVA tests showed no significant difference between the buffered and non-buffered groups. Accumulation rates shown in Table 2 do not show any major differences between the groups, but clear temperature dependence. Sabatier or FTT reactions are the most widely invoked explanations if abiotic CH4 is detected in olivine chemical weathering experiments (surface-liquid reactions) [17, 19]. FTT reactions are supported by catalysts such as native metals or oxides of Fe, Ni or Cr , which are common constituents of natural olivines . 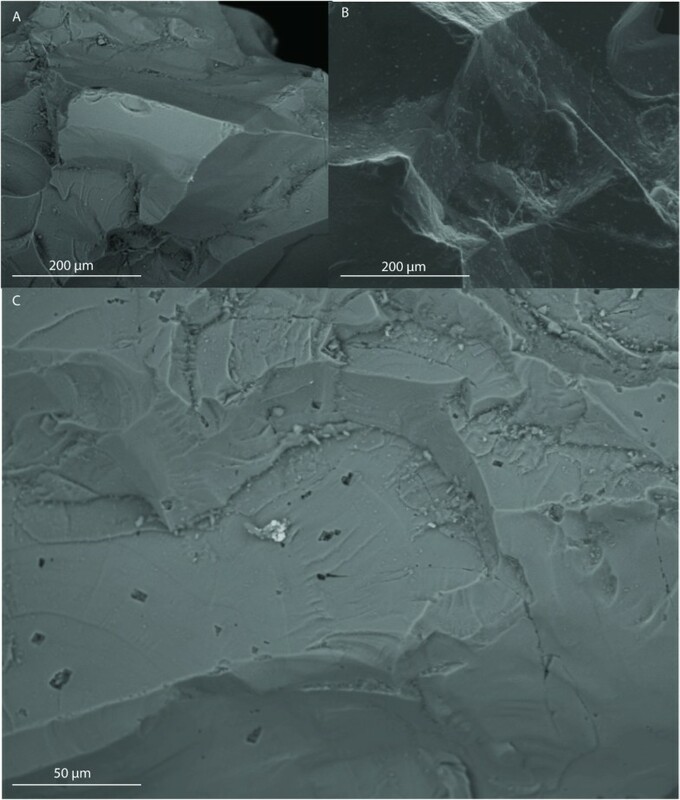 XRD and microscopy analyses of the olivine used in these experiments revealed the presence of magnetite (Fe3O4) and chromite (FeCr2O4) (Figures 1a and 1b), both of which are known to have a catalytic effect on the FTT reaction [23, 36–38]. Hence, catalysts necessary for FTT reactions were clearly present. Also, other specific areas on the olivine grains were observed by SEM to contain potential catalysts, such as an O-free phase with a Fe content of 95.01 atomic% (Figure 1c) and other phases containing Cu, Fe and Ni (Figure 1d). Sabatier or FTT reactions reduce CO2 to CH4 but are thought to require high temperatures or strong catalysts . The occurrence of efficient catalysts such as magnetite and chromite in our system may explain reactions involving the reduction of CO2 into CH4 at lower temperatures than expected. Altogether we confirmed the presence of all the components involved in FTT reactions (i.e. H2, CO2, CO, CH4, H2O and necessary catalysts), as well as the accumulation of CH4 over time at statistically significant rates even at very low temperatures. In order to lower the redox potential enough to reduce CO2, it is necessary to have enough H2 in the system as well as a good catalyst. The accumulated H2 (Figure 4) may both be released from the dissolving minerals themselves  and formed through the splitting and reduction of water through the oxidation of solid, ferrous iron [17, 19, 39]. Standard thermodynamic calculations of the possibility of H2 formation using the temperature and pH ranges of our experiments, 30-70°C and pH 7-10 indicate that the ΔG of formation of H2 is negative regardless of the conditions within these ranges . At 30°C, the ΔG of H2 formation is between -100 to -200 kJ/mol while at 70°C the ΔG is between -150 and -275 kJ/mol indicating that H2 is formed even in low temperature reactions through oxidation of Fe2+. The calculations are based on the oxidation reaction of Fe2+ to Fe3+ (Eqs. 4 and 5) with the activity set to 1 for all species. If activity was set to values lower than 1, such as the amount of moles of Fe2+ in solution after 1 month of incubation (5.40E-7 mol), the ΔG of H2 formation is around 48 kJ/mol and thus not thermodynamic favorable. This means that Fe2+ should be in a solid state in order to reduce water into H2. Concentrations used for the calculations are the measured headspace values ranging from 10.6-32.7 ppmv of H2. The accumulated concentration of H2 after 9 months of incubation is enough to possibly sustain the survival of some strains of methanogenic archaea  but the rates of formation are probably too low to sustain any growth. Further studies have to be made to test the possible survival and growth of hydrogenotrophic methanogenic archaea. Any presence of iron carbides in the samples could contribute to the formation of H2 (Eq. 6) but neither ESEM nor XRD analyses revealed any occurrence in the samples and because of this, the formation of H2 through carbide oxidation (Eq. 6) is not considered to be important in our experiments. The accumulation of CH4 in the headspace of the incubation bottle could be explained by either the reverse water-gas shift reaction (RWGS, Eq. 7) followed by FTT reaction or oxidation of Fe2+ in the olivine structure with HCO3- in solution (Eq. 8) and the followed FTT reaction (Eq. 3). The RWGS reaction is the formation of H2O and CO from the reaction between H2 and CO2. At low temperatures, the RWGS has to be catalytically driven in order to be thermodynamically favorable . Unless catalytic sites are available on the olivine surface, the RWGS reaction is not thermodynamically favorable at the experimental temperatures. However, reaction 9 is thermodynamically favorable (ΔG is in the range of -97.27 to -248.50 kJ mol-1). The formation of H+ in the reaction (Eq. 8) will not lower the pH of the solution due to the buffering effect of silica . With the existence of CO, CO2 and H2, the formation of abiotic CH4 (Eqs. 2 and 3) is thermodynamically favorable at our experimental temperatures (ΔG is in the range of -33.67 to -96.35 kJ mol-1). Random sample bottles from all sample groups, i.e., all temperatures and solution types were picked and measured for dissolved Si and plotted against CH4 (Figure 6). Accumulation of CH4 in the headspace of the incubation bottles seems to be strongly correlated with Si release into the liquid phase. It is unclear as to why the regression line does not cross nearer the origo. The lag before the Si concentration increase could be due a threshold effect. Our data suggest a close link between olivine dissolution, serpentinization reactions and CH4 formation. This indicates that the changes in CH4 concentration, which are easily measured, can be used as a proxy for olivine dissolution in systems similar to ours. If so, the linear accumulation of CH4 over time also indicates linear olivine dissolution over the 9-month timescale of our experiments. The Mg, Ni and Fe ions in solution are showing clear time dependence (Figure 5a, b, c). Below 70°C, there is an increase in elemental concentration in solution but at 70°C there is a strong decrease in dissolved ions, probably due to secondary mineral precipitation, chelation or flocculation. These elements are probably incorporated into new, hydrated minerals such as serpentine or other solid phases at the surface or in solution. Another possibility is that weathering of the natural olivine releases colloids as well as ions in solution, leading to flocculation instead of precipitation. This process does probably not account for the total decrease of elemental concentration seen in the charts, but may be a process in addition to precipitation. Chelation processes, in which organic molecules surround a metal ion and therefore makes it colloidal may also be a possible process, even though the low concentrations of hydrocarbons in the system should keep this process minimal. This study illustrates the interactions between water and natural olivine that result in formation of H2 and CH4. The formation of CH4 was observed to be strongly correlated with olivine dissolution rates at temperatures ranging from 30 to 70°C. This may have important implications regarding questions about early life on Earth because high quality electron donors (H2 and CH4) can be released when water interacts with very common minerals at temperatures suitable for living cells and not just at temperatures above 100°C as previously reported. This substantially expands the range of environments suitable for chemosynthetic organisms on the early Earth. The relationship between the release of Si and the formation of CH4 in the headspace of the incubation bottle is linear at low temperatures and at pH values of 8-9, which could be an indicator for the dissolution of olivine. Magnesium and iron release over time is more difficult to monitor due to precipitation as secondary minerals, flocculation or chelation, and may therefore not be used as an indicator for CH4 production or olivine dissolution. This work has been supported by the Swedish Research Council (contract 621-2008-2712) and the Stockholm University Astrobiology Graduate School. We acknowledge Swedish Geological Survey (SGU) for help with the XRD analyses as well as Sara Holmström for constructive criticism and discussions. We also acknowledge Marianne Ahlbom for help with the ESEM and Andrei Shchukarev for the XPS analyses at Umeå University, Sweden. AN drafted the manuscript. AN and ND carried out the experiments. AN, ND, DB and NGH designed the experiment, contributed to the interpretation of the results and discussion. PC participated in PP1 and GC analyses. All authors read and approved the final manuscript.